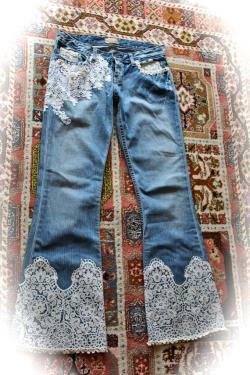 Bohemian rococo jeans antique lace embellished french romantic shabby tattered distressed. Romantic, cute, sweet and classy chic. Label is bke made in mexico size 30" waist x 32" inseam. There are no tears or holes,,, yet. You can add them wherever you like and it will only enhance them. 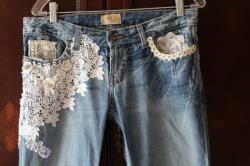 Embellished with vintage antique lace from the 1920s on the leg bottoms. Bottom edge has bridal lace where the bulky hem was removed. 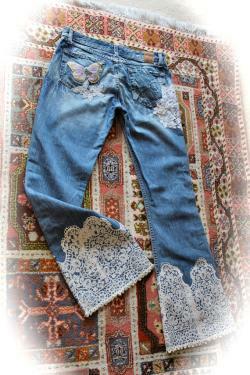 Lace on the bottom was heat bonded with high durability fusion and then machine stitched and stitched some more. 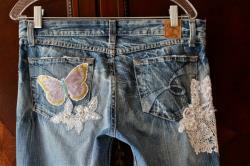 On the back right pocket is a large embroidered butterfly and a wedding lace flower with sequins. 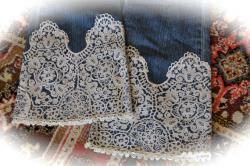 Front and right hip have a variety of vintage wedding lace and rhinestones. Main metal button has a brown rhinestone cemented in. These should be dry cleaned to keep the lace in tact as long as possible. Compromise and the rich beauty will evolve with it. Washing in the machine on any setting will hasten the compromise of the lace. From a pet free, smoke free home. I'm happy to send extra pics and answer any questions.